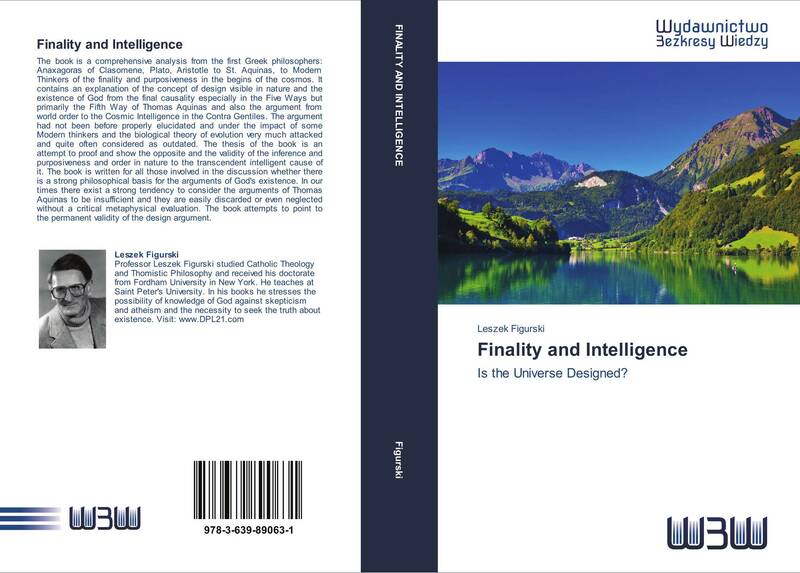 The book is a comprehensive analysis from the first Greek philosophers: Anaxagoras of Clasomene, Plato, Aristotle to St. Aquinas, to Modern Thinkers of the finality and purposiveness in the begins of the cosmos. It contains an explanation of the concept of design visible in nature and the existence of God from the final causality especially in the Five Ways but primarily the Fifth Way of Thomas Aquinas and also the argument from world order to the Cosmic Intelligence in the Contra Gentiles. The argument had not been before properly elucidated and under the impact of some Modern thinkers and the biological theory of evolution very much attacked and quite often considered as outdated. The thesis of the book is an attempt to proof and show the opposite and the validity of the inference and purposiveness and order in nature to the transcendent intelligent cause of it. The book is written for all those involved in the discussion whether there is a strong philosophical basis for the arguments of God's existence. In our times there exist a strong tendency to consider the arguments of Thomas Aquinas to be insufficient and they are easily discarded or even neglected without a critical metaphysical evaluation. The book attempts to point to the permanent validity of the design argument.